This article originally appeared on Materials Today. Click here for the original article. An ice dendrite grown in space (Credit: Hokkaido Univ./JAXA). Although ice crystals are all around us, both on Earth and in space, it isn’t fully understood how their beautiful structures form. Japanese scientists have blasted their experiments to the International Space Station in a quest to fathom out how ice crystals grow. Filling this knowledge gap would aid climate change and other meteorology research. It would also help researchers understand how other commercially-important dendritic silicon and metal crystals grow, that are even harder to study directly. Such fundamentals of crystal growth form the basis of the first volume of the Handbook of Crystal Growth, published by Elsevier and available on ScienceDirect. The first set of ice experiments took place between December 2008 and February 2009 in the Japanese experiment module known as Kibo. These experiments were 15 years in the making, having originally been selected for the mission in 1994. Furukawa blames “dilly-dallying” for reasons such as the economic status and shuttle accidents for the delay. “We were about ready to give up many times,” he explains. But it was worth the wait. The team were able observe the growth process of perfectly hexagonal ice crystals, in supercooled heavy water, 134 times during this first three month period using two onboard interference microscopes. The growth process was already known to start with the formation of smooth disc-shaped ice crystals. These then grow and eventually become unstable at the edges, causing branches – known as dendrites – to start to form. The reason for the instability was previously not understood. These space experiments showed that the instability occurs at the point when the crystal’s growth has faltered and then started again. “A change from stopping growth to beginning growth may initiate the instability along the edge of ice circular disk. This is the beginning of the instability and after this moment the dendrite pattern continues to develop,” explains Furukawa. “This result means that the growth of basal face [the disc-like crystal] is a key process for beginning the instability.” The team were also able to measure the growth rate at the dendrite tips of the ice crystals very precisely. 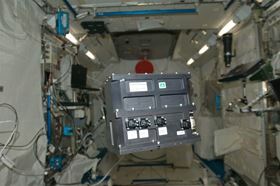 The experimental apparatus floating inside the Kibo module (Credit: Hokkaido Univ./JAXA). Between November 2013 and June 2014, Furukawa’s team co-ordinated a second set of ice experiments onboard Kibo. They repeated the same experiment, but this time a small amount of an antifreeze glycoprotein was added to the water to see how this affected the growth process. “This is a functional protein with the capability to prevent the freezing of living fishes in subzero condition underneath the sea ice,” explains Furukawa. The results of this second set of experiments have not yet been published. The Handbook of Crystal Growth is available on the Elsevier Store at a 25% discount. Use discount code “STC215” at checkout and save!